North Yorkshire County Council have approved an application to frack for shale gas. 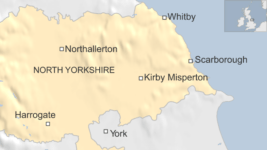 Despite protesters gathering outside the Council offices yesterday, the North Yorkshire County Council granted permission for fracking at Kirby Misperton in Ryedale. A series of submissions from 75 people, some for and some against fracking, were heard in the days before the final decision was made. Simon Bowens, Yorkshire and Humber campaigner for Friends of the Earth, said: “This is an absolute travesty of a decision but the battle is very far from over. “Today seven out of 11 North Yorkshire county councillors voted to approve this fracking application in Ryedale, ignoring the objection of Ryedale District Council itself, as well as thousands of local residents and businesses. Fracking, which is short for hydraulic fracturing, is the process of drilling down into the earth and firing a high pressure mixture of water, sand and chemicals into the rock, releasing the gas inside. Opponents say it can cause water contamination, earthquakes and noise and traffic pollution. Richard Black, Director of the Energy and Climate Intelligence Unit (ECIU), said: “Although proponents of fracking will claim today’s decision as a victory, the fundamental questions around UK shale gas haven’t changed. “As we see from protests outside the council today and from opinion surveys, the public is not supportive, and the economics remain unclear – so whether commercial fracking ever goes ahead is still an open question. “Other issues also remain open. Last year, the Commons Environmental Audit Committee said fracking is incompatible with our climate change targets, and the government hasn’t been able to show they’re wrong. If leakage rates are above a few percent, gas burning turns out to be worse than coal for climate change, and yet the government hasn’t set a maximum permissible leakage level. The bid by Third Energy, which was recommended for approval two weeks ago, could be the first fracking operation in England since a ban on the process was lifted in 2012. Richard Claxon, from Filey, a Greenpeace volunteer who has campaigned against fracking in Yorkshire, said: “It’s a huge disappointment for people in Ryedale and beyond who have been campaigning tirelessly to keep this part of Yorkshire free from fracking. There is a real coalition of people from different backgrounds and walks of life who have come together to stop fracking in this area.